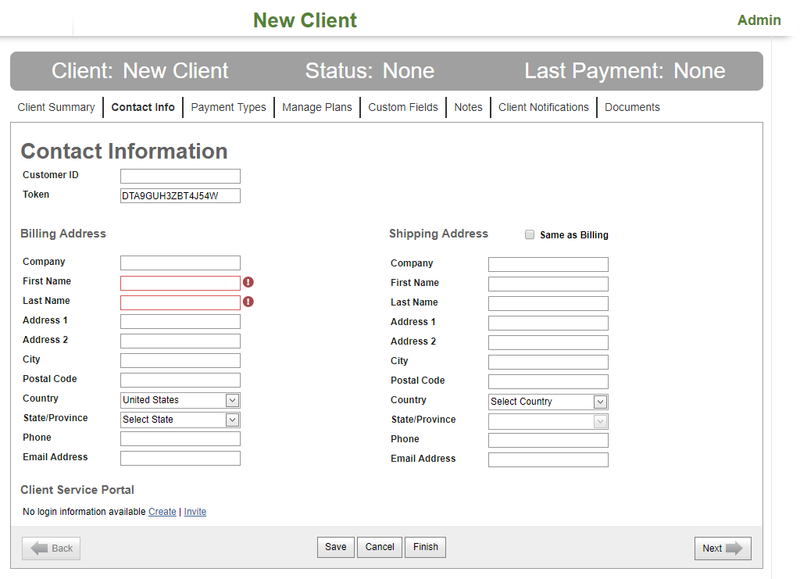 The Client Summary page gives the merchant a quick view of the Client’s stored details. Step 1: Click the Data Vault > Clients > New on the menu bar. Step 2: Enter the Client ID if you want additional customer identification number beyond the system generated Data Vault ID. Step 3: Enter Contact Information for the Client. 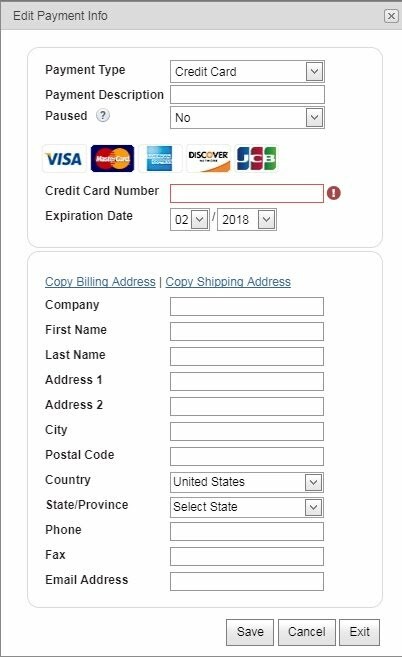 The system stores both the Billing and Shipping Address, only the Billing Address is required (each required field is marked with red outline and "!" icon). 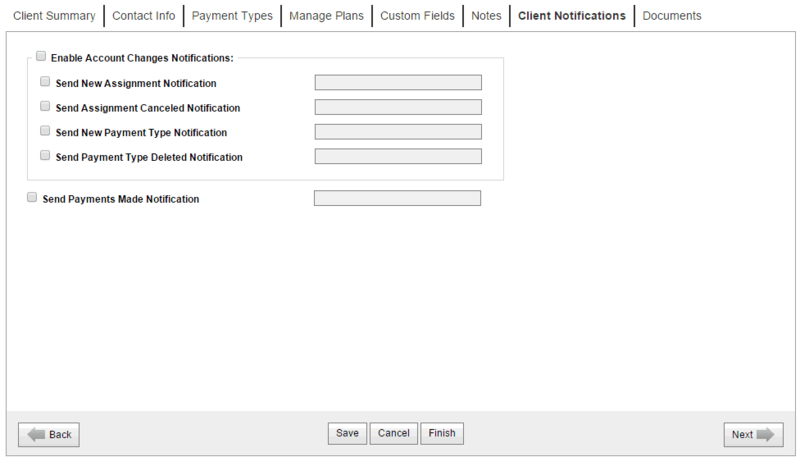 Step 4: Click Create in the section Client Service Portal and enter all required information in order to give the client an ability to login in the client portal. Also user can sent to client email with invitation to join the company. If previously customer did not register user. After click on the button, an email input will be shown. Step 2: To send a notification with invitation, enter email address and click Save. The notification contain the link to page for enter username and password. 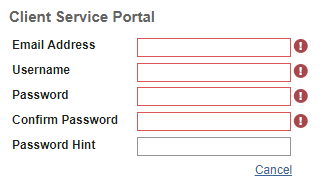 Client can use the entered login and password for log in to CSP. If previously customer register user. After click on the button, the notification with invitation is sent. The notification contain username and link to page for enter password. 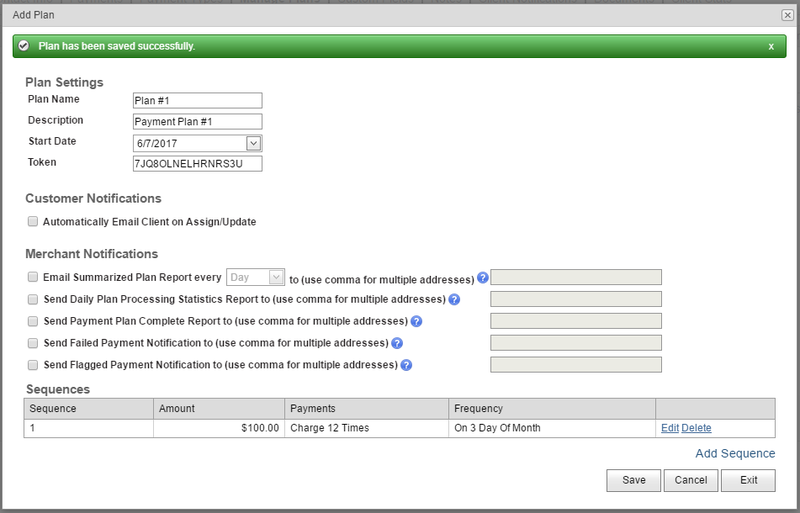 Step 6: On the Payment Types tab press the Add Payment Type button. Step 7: Enter Credit Card or Bank Account information (for echecks or ACH). Step 8: Select if this account should be monitored by Account Updater (option 'Monitor Account' - available only for Credit Cards). Step 9: Enter Billing Address. Step 11: Add another Payment Type or click Next. 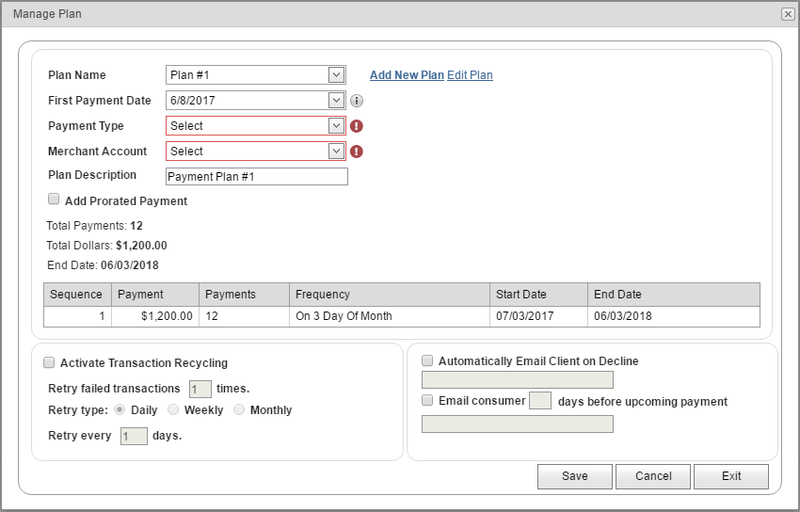 User can create a new Recurring Payment Plan on the Manage Plan popup. If a appropriate plan already exists, user can select Plan Name it from the list and skip to step 11. Step 1: Choose Assign New Recurring Plan on the Manage Plans tab. Step 2: Click on the Add New Plan link on the Manage Plan popup. Step 3: Enter Plan Name. Step 5: Enter Start Date. Automatically Email Client on Assign/Update (if enabled - email notification will be sent to the client each time the assignment is created/updated). Step 8: Click Add Sequences for the plan. 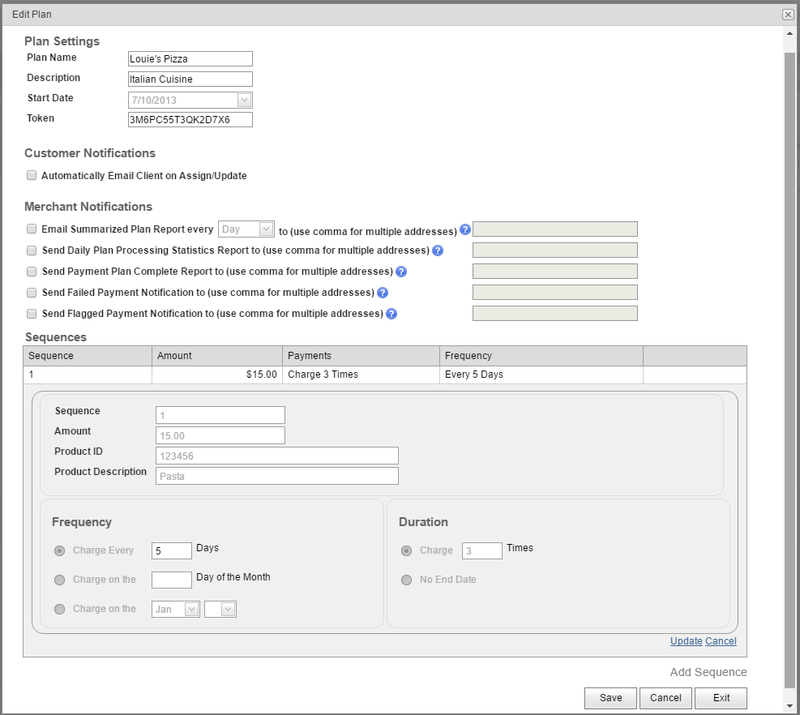 Step 9: Specify Sequence settings (amount, product ID, product description, frequency and duration). Step 17: Choose to Activate Transaction Recycling by checking the box. 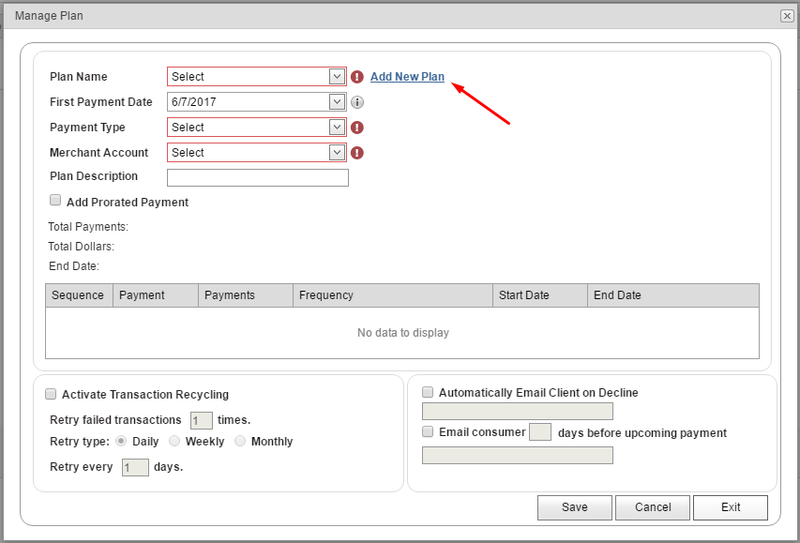 Follow the next three steps if Transaction Recycling is selected or skip to Step 20. Step 21: Choose to Automatically Email Client On Decline by checking the box. Step 22: Choose to Email consumer [n] days before upcoming payment by checking the box. Step 23: Click Save or Exit. Step 24: Click the Manage Plans tab and select Assign New Plan to create another plan. 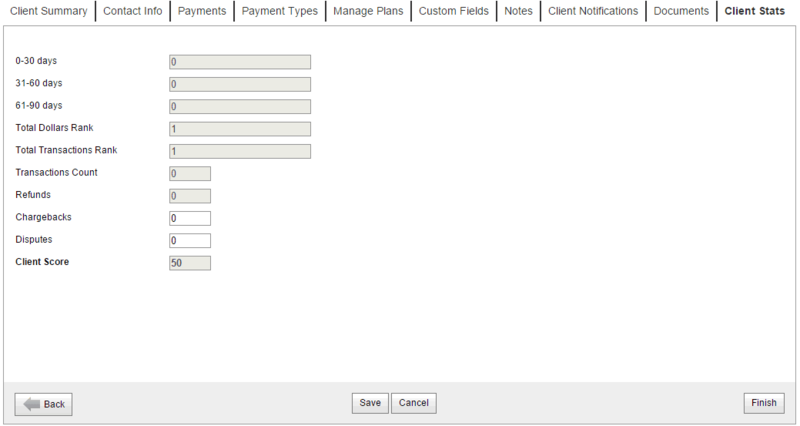 User can also edit selected Payment Plan on the Manage Plan tab. User can edit both the newly created plan and any one selected from the list. Step 1: Select Plan Name. Step 2: Click on the Edit Plan link. Step 3: Make the necessary changes. Plans that are not assigned to any client can be fully edited. 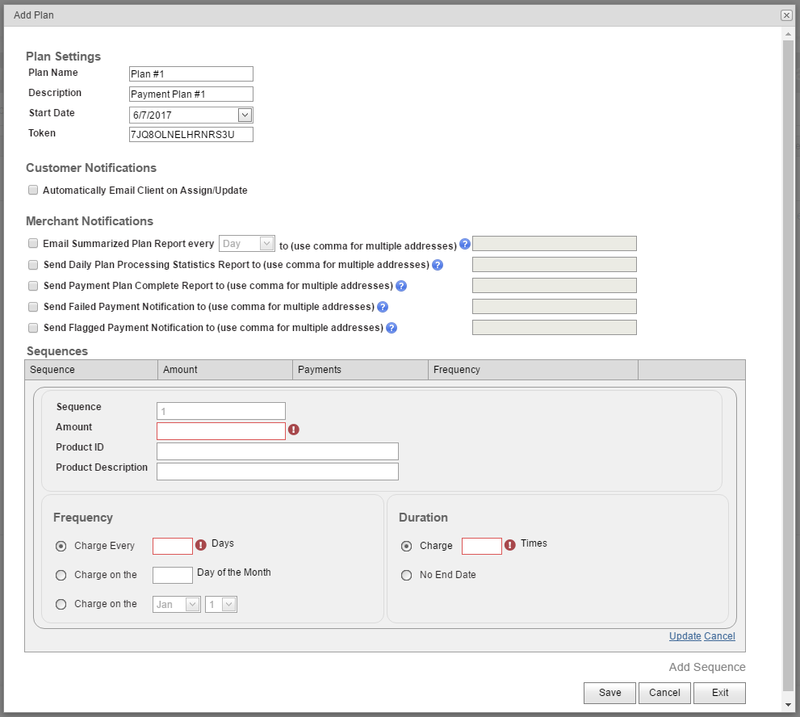 But user is unable to add/delete sequences for the plans that are already assigned to any client - he is able only to edit sequencies frequency for such plans. Changes in sequences will be applied to all plan assignments after saving them. Step 1: Choose Assign New Layaway Plan on the Manage Plans tab. Step 2: Enter Amount Purchased. Step 3: Enter Product ID. Step 4: Choose Payment Type. Step 8: Click Generate Plan. The Plan Summary will display. Step 9: Click Save or Exit. 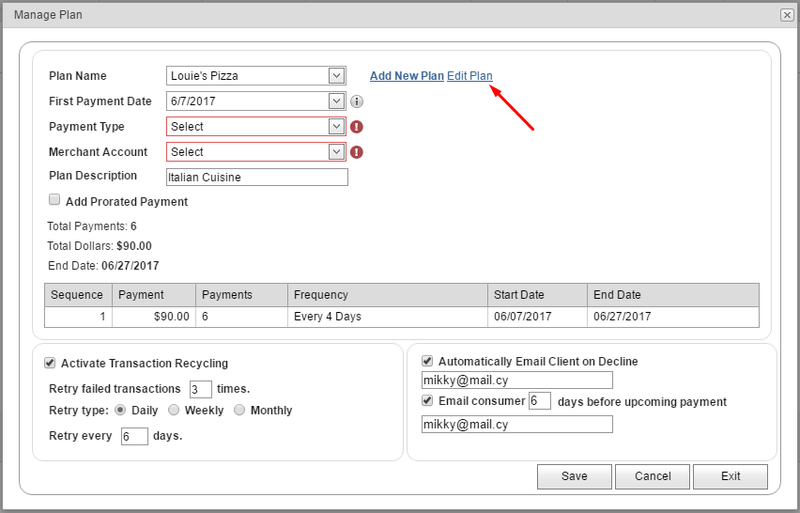 Tip: The only way to create a Layaway is from the Manage Plans page with a customer loaded. The payment for a layaway plan is determined by the Layaway Rules (see below). Custom Fields can be used (created) to more specifically tailor the Data Vault to the merchant’s needs. Use the Administration > Custom Fields menu option to setup Custom Fields. Step 1: Complete the empty Custom Fields. Tip: For Custom Fields to be visible in the Data Vault, the Everywhere Display Option must be selected when configuring the field. Go to Administration >Custom Fields to change this setting. Step 1: Add notes pertaining to the customer. 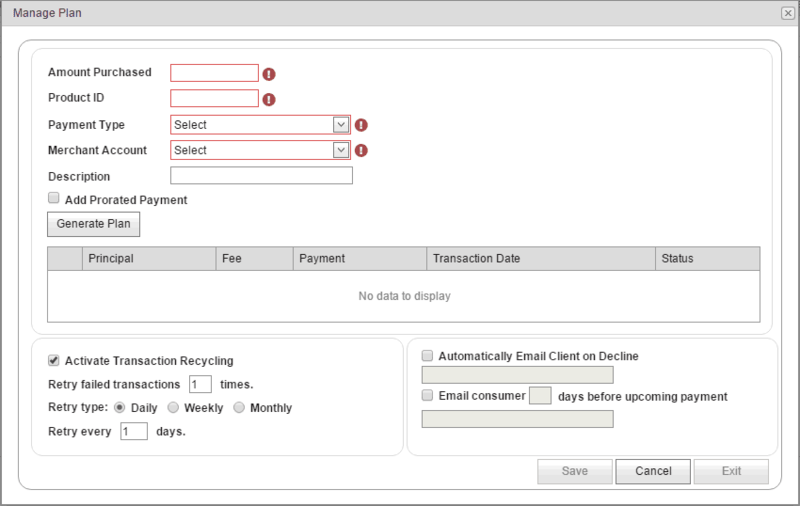 Step 1: Setup email notifications for different events (new assignment created, assignment canceled, payment type created, payment type deleted and payment made). 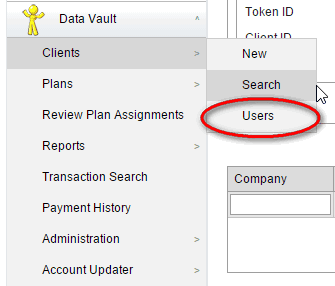 Step 1: Here user is able to upload different documents relating the current data vault client. This feature is only available after a Client has been stored in the vault and is accessible in Edit mode. 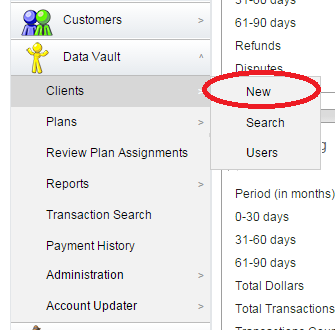 Step 1: Choose a client from the Data Vault > Clients > Search menu and click Edit. Step 2: Click the Payments tab. Step 4: Choose a plan from the Plan dropdown for Plan Payments. Step 2: Click the Client Stats tab. Points are awarded according to the Customer Scoring rule. 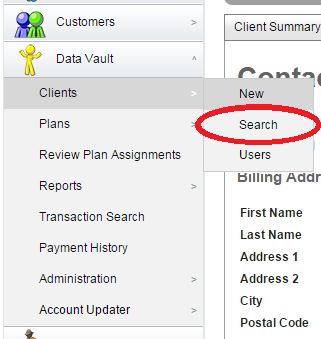 Step 1: Choose a client from the Data Vault > Search > Client menu and click Edit. Client Search enables merchants to find Clients in the Data Vault. Step 1: Click the Data Vault > Clients > Search on the menu bar. » Plan Name – All Clients who belong to a specific billing plan will be displayed. » Creation Date – Date range pertaining to the establishment of a Client in the system. » AU Operation Date – Date range of the latest update from Account Updater system. o All – Clients having all of the following Client statuses will be displayed. o Active – Client is enrolled in a payment plan. o Incomplete – Setup of the Client was not finished. o Inactive – Client has been deactivated. o Archived – Client has been “Deleted” by the merchant. The actual Client record will remain, but will not be usable. o All – Clients having all of the following AU statuses will be displayed. o Account Closed – Client's payment type has been deleted. o Card Updated – Credit card from client's payment type has been updated. o Expiration Updated – Expiration date of credit card from client's payment type has been updated. 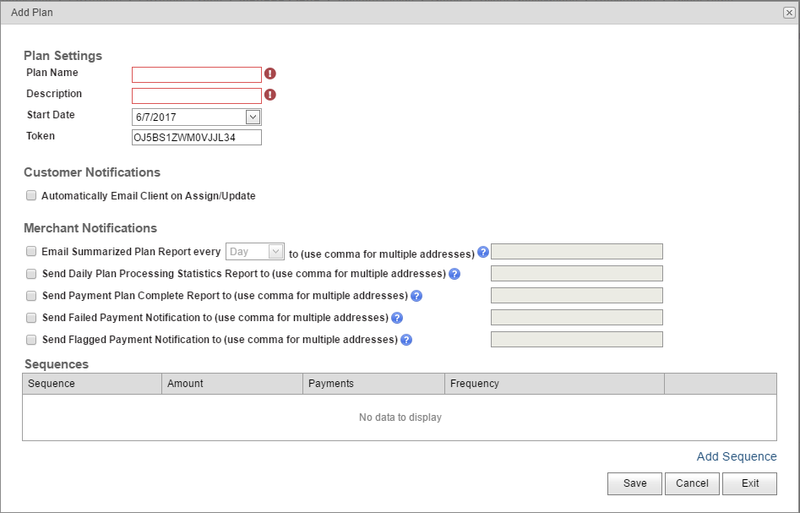 o All – Clients having all of the following Payment statuses will be displayed. o Cancelled – Client enrollment has been cancelled. o Complete – Client successfully completed all payments. o Declined – Last payment was Declined by the processor or issuing bank. o Expired – Payment Type is Expired, this generally pertains to credit cards. o Failed – Last payment failed. 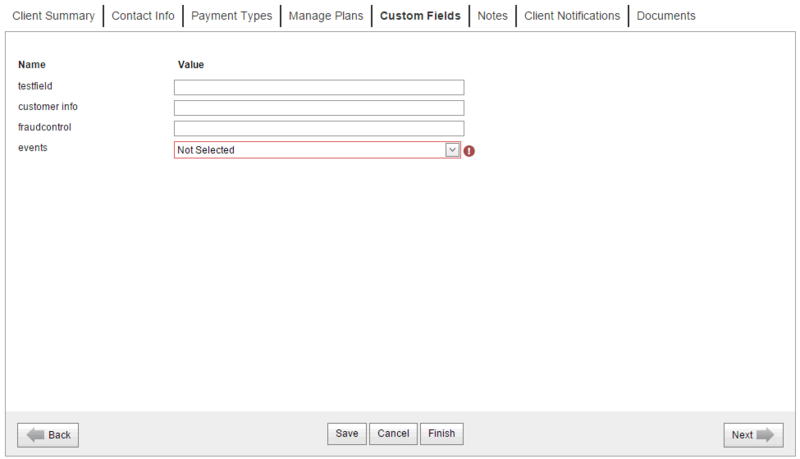 o None – Client has not yet processed a payment. The Sale link opens the same popup that described in the section Quick Pay above. When Delete link is pressed the client will not be actually deleted - his status will be changed to Archived and all his plan assignments will be cancelled. Later this client can be Undeleted and his status will be changed back to Active. All users registered in the Client Service Portal are listed on the page Data Vault -> Clients -> Users. User is able to edit any client user, to reset password for any user, to lock/unlock them, to invite and to login as any user into the Client Service Portal.